The purpose of the symposium is to explore theoretical and practical issues with respect to developing university students’ creativity and disseminate cutting-edge academic research in the area, and promote the further development of Macao's university sector. The international conference on “The Cultivation of Creativity in University Students’” is being held from 6th – 8th November, 2013 at Macao Polytechnic Institute. Colleagues are cordially invited to participate in the Symposium. 1. Theories and analyses of student creativity. Our ability to imagine and then invent new worlds for ourselves is one of our greatest assests and the origin of all human achievement, yet the importance of creativity in learning and achievement is largely unrecognised in a higher- education world that places more value on critical and rational thinking. It is the vision of higher-education world in which the creativity of learners is valued equally alongside more traditional forms of academic achievement, that provides the driving force for this book. Developing Creativity in Higher Education grew out of the Imaginative Curriculum Network collaborative learning project facilitated by Norman Jackson, the principal author. It is the first book to systematically address the issue of creativity in higher education. It features an analysis of the problem of creativity in higher education and rich perspectives on the meanings of creativity in different teaching and disciplinary contexts. It provides illustrative examples of teaching and assessment strategies to encourage teachers to examine their own understandings of creativity in order to help students to develop their own creativity. And it offers practical advice on how to foster creativity at an individual, subject and institutional level. In 2008, the Surrey Centre for Excellence in Professional Training and Education, at the University of Surrey, began to explore the idea of lifewide learning and create new educational practices to encourage and support learners in their lifewide learning enterprise. 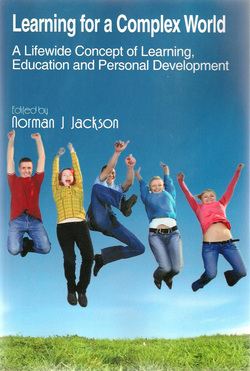 The Surrey Lifewide Learning Award was piloted and evaluated and the results were published in a book (Jackson 2011). The University of Surrey did not adopt the award so in 2011 a new organisation the Lifewide Education Community was established to promote, develop and apply the ideas developed by SCEPTrE. The organisation's 'Lifewide Development Award' is in the early stages of piloting. The scheme is intended to complement the skills award schemes being offered by UK universities and colleges.It can also be adapted by universities and colleges for implementation in their environment. It can also be adapted for use by anyone who is not participating in formal education.